Gui Minhai, a Swedish citizen, is co-owner of the Mighty Current publishing house—famed for producing books that delve into the private lives of China’s leadership—and a writer, publisher, and former Independent Chinese PEN Centre (ICPC) Board member. Gui disappeared from his beach house in Thailand on October 17, 2015, and later resurfaced in mainland China; it is believed that he was abducted and brought to China against his will. On January 17, 2016, the Chinese state-run channel CCTV aired a videotaped statement by Gui in which he claimed he went to the mainland voluntarily, but observers believe that his confession was forced. Since then, he has remained in detention, with almost no access to visits by Swedish consular officials, and no contact with his family. Gui Minhai is a poet, author, and book publisher, and is one of the “Causeway Bay Bookstore Five,” a group of five booksellers affiliated with Causeway Bay Books and its owner, Mighty Current Media. All five booksellers disappeared under mysterious circumstances in late 2015, only to later reappear in Chinese state custody in mainland China. The evidence clearly demonstrates that Chinese security agents were responsible for these disappearances. Mighty Current Media is a Hong Kong-based publishing company best known for its sensational books about Chinese leaders’ private lives. Such books are banned in mainland China, but legal in Hong Kong. Causeway Bay Bookstore was similarly well-known as a bookstore offering such banned books. Gui Minhai, a co-owner and publisher of Mighty Current. Gui Minhai, a Swedish citizen who reportedly renounced his Chinese citizenship decades ago, disappeared from his vacation home in Pattaya, Thailand on October 17, 2015. He re-appeared months later in Chinese custody. Gui and his colleagues later appeared in a set of “confessional videos” that—all evidence indicates—were scripted and staged by government authorities. In the months since, four of the five booksellers—all but Gui Minhai—were released from detention, though they remain under the coercive power of the Chinese state. Gui Minhai remains in detention, separated from his friends and family and without access to a lawyer, despite the apparent absence of any formal legal charges against him. The Chinese government has still not offered any satisfactory account of how he and his colleagues disappeared only to re-emerge in Chinese custody. January 24, 2019: Gui’s daughter, Angela, and Sweden’s Ambassador to China, Anna Lindstedt, meet with two Chinese businessmen. In an article Angela publishes recounting the meeting, Angela says the businessmen told her she had to stop speaking out about Gui’s case if she wanted them to continue negotiating on his behalf. Angela, who was previously unaware of such negotiations, refused to do so despite verbal attacks. Lindstedt, according to Angela, trusted the businessmen, believing Angela should have accepted the deal. Both the Swedish Ministry of Foreign Affairs and the Chinese Embassy in Stockholm claim ignorance of such meetings, the former launching an internal investigation of Lindstedt and appointing an interim in her place. August 13, 2018: Swedish Foreign Minister Margot Wallström announces that a Swedish doctor has examined Gui Minhai. 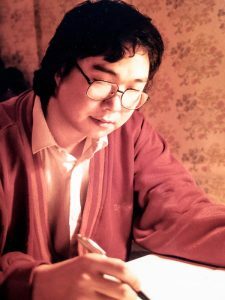 July 2018: The Washington Post publishes two previously unpublished poems by Gui Minhai. One of the poems, entitled “Père David’s deer,” was written while Gui was in detention. The article also highlights the grave concerns that Angela Gui, Gui Minhai’s daughter, has for her father’s health. February 8, 2018: Gui appears before reporters at a detainment center in Ningbo claiming, in what appears to be his third forced interview, that after daily berating from Swedish authorities, he fell for their plan to use his medical appointment on January 20, 2018 as a cover for transportation to the Swedish embassy. He accuses the Swedes of ruining his life and vows never to trust them again, saying they are “sensationalizing” his case. January 2018: Gui was traveling to Beijing by train for a medical exam after showing symptoms of amyotrophic lateral sclerosis (ALS) with two Swedish diplomats on Saturday, January 20, when he was seized by plainclothes police and forcibly removed from the train. After the incident, Chinese officials reportedly told Swedish diplomats that Gui was suspected of sharing secret information with the Swedes, and of meeting them illegally. October 2017: Gui is briefly released into a form of closely monitored house arrest. October 2016: On the one-year anniversary of Gui Minhai’s abduction, his daughter Angela publishes an article in The Washington Post appealing to the public not to forget her father’s case and calling for democratic countries to step up their pressure on the Chinese government. September 2016: After repeated requests for consular access to Gui, Swedish diplomats are granted a brief meeting with him. This meeting marks only the second time in almost a year that Swedish officials have had access to Gui, a Swedish citizen. Angela Gui, the daughter of bookseller Gui Minhai who previously went missing from Thailand, has appeared at a US congressional commission hearing on China. February 2016: After repeated requests for consular access to Gui, Swedish diplomats are allowed a brief meeting with him for the first time. At the meeting, Gui tells Swedish diplomats that he does not want their assistance. Later in the month, Lui Por, Cheung Chi-ping, Lam Wing-kee and Gui Minhai all appear on Phoenix TV, a privately-owned Hong Kong-based news outlet that enjoys close ties to the Chinese government. In their interviews, Lui, Cheung, and Lam purportedly confess to distributing unlicensed books on the mainland, selling unauthorized books in China via an online platform, and evading customs inspections to deliver about 4,000 books to 380 customers since October 2014. Lui, Cheung, and Lam all name Gui as the lead figure in this unauthorized distribution. Gui, in his interview, confesses that he has “explored ways to circumvent official inspections in China.” This series of videos are similarly widely understood—including by PEN America—to be forced confessions. January 2016: CCTV, Chinese state television, airs a videotaped statement by Gui in which he claims he went to the mainland voluntarily. Gui says that he had previously fled the mainland after receiving a two-year suspended sentence for his involvement in a fatal drunk driving accident in 2003. He claims that he returned to the mainland to turn himself in. The video immediately raises suspicions that Gui’s confession was forced. December 2015: The Guardian runs an article about Gui Minhai’s disappearance. In it, Angela Gui explains that her father has made regular calls to his wife, “telling her he is fine but not answering any questions regarding his whereabouts.” Gui’s colleague Lee Bo tells The Guardian, “We don’t know what happened and we don’t know who has taken him, whether they were Chinese or Thai. Nothing is clear.” (Lee Bo himself disappears days later). November 2015: Gui contacts his daughter Angela after failing to respond to her messages for two weeks after his disappearance. Via Skype message, he says, “I have put [HK$30,000] in your account in Hong Kong, and hope you will be fine with everything.” Bei Ling, the former president of the Independent Chinese PEN Center and longtime friend of Gui, travels to Pattaya, Thailand, to investigate the circumstances of Gui’s disappearance. During Bei’s investigation, he obtains video surveillance from Gui’s apartment from October 17 and learns from authorities that there is no written record of Gui leaving Thailand. October 2015: Gui Minhai, co-owner of the Mighty Current publishing house and a Swedish citizen, is last heard from when he sends an email to his business partner Lee Bo to say he has arrived in Thailand and to invite Lee to stay with him at his vacation condominium in Pattaya. Gui also sends an email to his printers asking them to get ready for a new book. On October 17, Gui disappears from his condominium. Surveillance footage from his building shows an unidentified man lingering outside the building until Gui arrives. A few hours later, the man gets into Gui’s car and the two drive off. Gui then calls the management company of his building and tells the attendant to put his fruit in the refrigerator and lock his apartment. PEN America’s comprehensive report on the Causeway Bay Bookstore Disappearances, including its analysis of forced confessions, of the role the Chinese state played in the five disappearances, and of the implications for Hong Kong’s “One Country, Two Systems” framework. The report includes a detailed timeline of the disappearances.